Bealiba War Memorial commemorates those from the district who served and died in World War One. 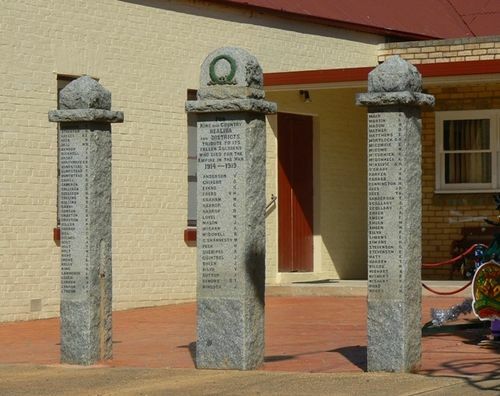 The memorial consists of three granite pillars (formerly gate posts) which were erected at the public hall. The centre pillar lists the names of the fallen. BEALIBA.—The Soldiers' Memorial fence and gates at the Bealiba Public Hall have been completed, the cost being £200. On three granite pillars are the names of 96 men who enlisted from the district. Sir John Monash is to be invited to unveil the memorial. Argus (Melbourne), 25 July 1923.